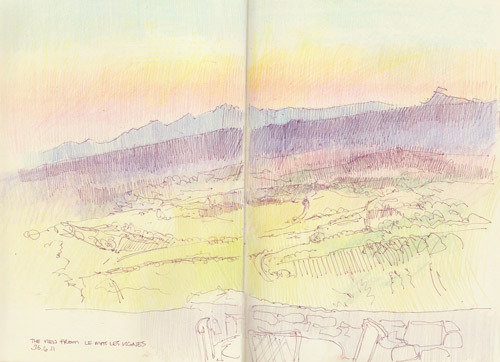 Two more plein air sketches - of a dinner at a restaurant called Le Mas des Vignes with a fantastic view of a sunset. First the preamble. On Thursday 30 June, I had a minor meltdown as I began to realise that the whole of France was about to take to the road at the weekend as the schools broke up on Saturday and their "grand vacance" was starting as mine ended. I was due to start travelling back to England on the Saturday morning. The bottom line was that getting a hotel room was providing to be very difficult. The notion that it was something that I could do with ease from the house went out the window as soon the thunderstorm blew the broadband. After 3-4 hours of phone calls and lots of pouring over my Michelin map and red book I finally got sorted. I almost didn't want to look at their websites when I came down to the bar in town to access the wifi and post to the blogs. However it turned out that it seemed as if I had picked a good (although not cheap) hotel for Saturday night in in Bourg en Bresse and decent places to eat on both Saturday evening and Sunday lunch. The latter was to be in Gevrey Chambertin on the Cote d'Or. The shenanigans with the bookings blew out any attempt to go visiting places on Thursday as I was mentally stwed by the time I'd finished doing the bookings - so I decided I had very definitely earned dinner out! I rang one of the restaurants which had been recommended to us and got a table. 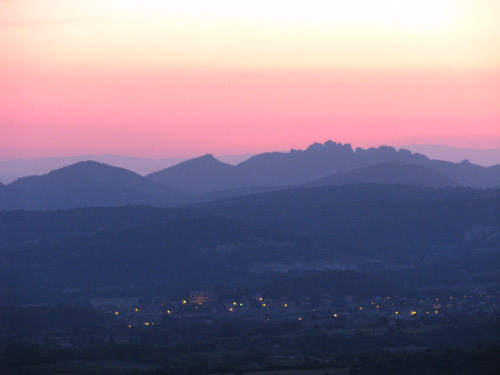 Which is how I came to be sat on a rather breezy terrace at Le Mas des Vignes, on the Route de Ventoux just outside Bedoin, watching an absolutely stunning sunset. I had the option of sitting indoors however I didn't want to miss the sunset and managed to collar a table which seemed to be in the most sheltered spot. L'Agneau aux Herbe de Provence, Risotto d'Epaule(?) de Sault et Petit legumes - the lamb was heavenly - absolutely delicious. Not quite sure what the reference to Sault was - but they do have some fine food shops there. Les Fromages de Fermier, et affines par Claudine Vigier ail confit - the cheese seems to have come from the best cheese shop in Provence - La Fromagerie du Comtat in Carpentras. and petit fours with my coffee. This was the meal when I began to notice that there was a pattern to the meals I'd been eating in restaurants - and this related to colour. The Chefs seemed to have a distinct leaning towards certain colours as all my dishes harmonised around a harmonic palette. Look back and you'll see what I mean. This is a sketch of the sunset as seen from my table. 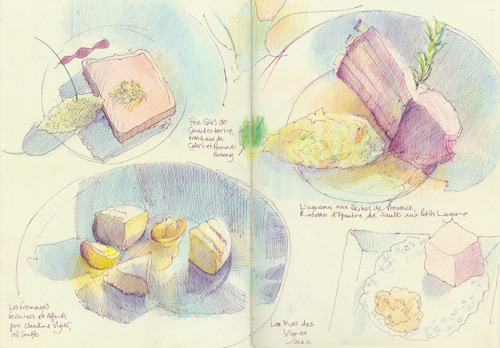 I sketched the food when it arrived and the sunset while I waited for the next course! and this is what it was like a little bit later! I didn't have enough pencils in my toolkit to quite get the colour and intensity of the sunset as it set properly.